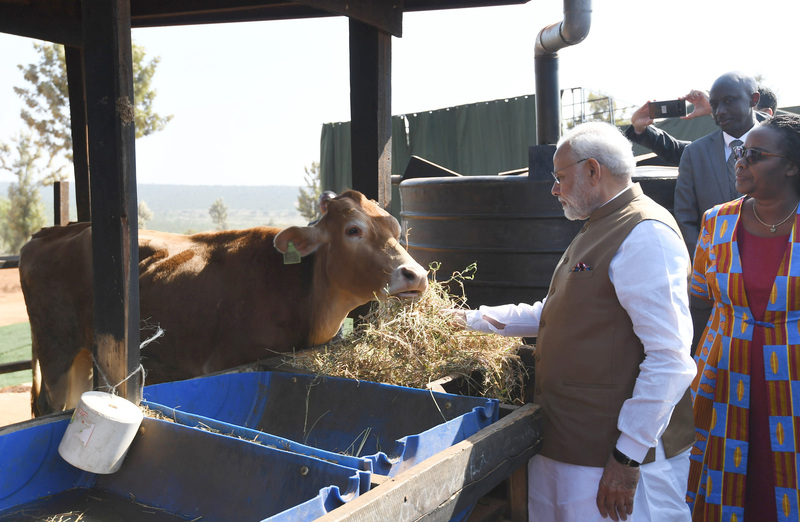 The Prime Minister, Shri Narendra Modi donates 200 cows under Girinka (one cow per poor family programme), at Rweru Model village, in Rwanda on July 24, 2018. NewDelhi: Indian Prime Minister Narendra Modi today gifted some very unusual gift to the people of the African Country Rwanda-200 cows. But what is the reason behind the unusual gift? He donated these locally sourced cows to the villagers under the Rwandan Government’s Girinka Programme. The word Girinka can be translated as ‘may you have a cow’ and describes a centuries-old cultural practice in Rwanda whereby a cow was given by one person to another, as a sign of respect and gratitude. Girinka was initiated by President Paul Kagame in response to the alarmingly high rate of childhood malnutrition and as a way to accelerate poverty reduction and integrate livestock and crop farming. The program is based on the premise that providing a dairy cow to poor Girinka Programme transforms livelihoods, reconciles communities improving agricultural productivity through the use of manure as fertilizers which would lead to improving soil quality and reducing erosion through the planting of grasses and trees. Since its introduction in 2006 hundreds of thousands have received cows through the Girinka program. By June 2016, a total of 248,566 cows had been distributed to poor households. The program has contributed to an increase in agricultural production in Rwanda – especially milk production and products, reduced malnutrition and increased incomes. The program also aimed at promoting unity and reconciliation among Rwandans based on the cultural principle that if a cow is given from one person to another, it establishes trust and respect between the giver and beneficiary.